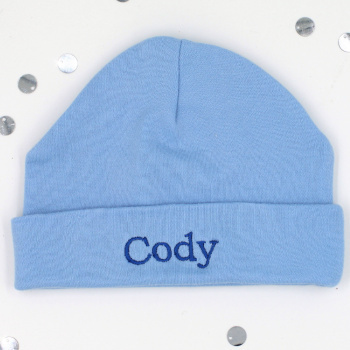 Adorable all cotton baby blue hat personalised for a special little one. This soft cotton jersey personalised baby hat makes the most delightful gift for a newborn or baby up to 12 months old. Machine washable for easy care. Comes with a name or initials embroidered on in your preferred font style. Select a gift of a Single hat OR a Pair - two hats.